Biryanis are rice-based casseroles that combine a saucy meat, vegetable or legume curry with basmati rice, whole spices, nuts and raisins. This particular dish is a nutritional powerhouse. Puree tomatoes, chopped onion and chiles to taste in a blender, scraping down the sides as needed, to make a smooth sauce. Heat 2 tablespoons oil in a large skillet over medium-high heat. Add raisins and cashews and cook, stirring, until the raisins are plump and the nuts are lightly brown, 1 to 3 minutes. Transfer to a plate with a slotted spoon. Add cumin seeds, cardamom pods, bay leaves and cinnamon sticks to the pan and cook, stirring, until fragrant, 30 seconds to 1 minute. Add the sliced onion and cook, stirring, until light brown, 2 to 3 minutes. Carefully pour in the pureed tomato mixture (it may spatter) and reduce heat to medium. Stir in garam masala, 3/4 teaspoon salt and turmeric. Simmer, partially covered, stirring occasionally, until most of the liquid evaporates, about 15 minutes. Meanwhile, place rice in a medium bowl. Cover with water. Gently rub the rice through your fingers to wash the grains. (The water will become cloudy.) Drain. Repeat three or four times, until the water remains relatively clear. Then cover the rice with cold water and let it sit for 20 minutes. Drain. 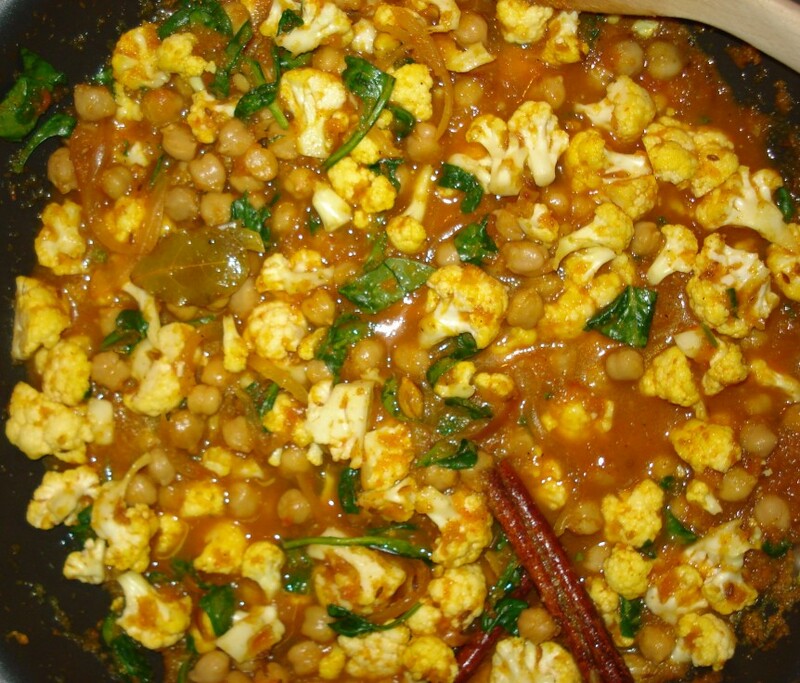 Stir mustard greens, cauliflower, chickpeas and 1 cup water into the tomato sauce. Cover and remove from the heat. Preheat oven to 350°F. Lightly coat a 9-by-13-inch baking dish with cooking spray. Heat the remaining 1 tablespoon oil in a medium saucepan over medium-high heat. Add the drained rice and saffron, and carefully stir (it may spatter) to coat the rice with the saffron. Add the remaining 1 cup water and 1/4 teaspoon salt. Stir once to incorporate the ingredients. Bring to a boil over medium-high heat. Cook, uncovered, until the water has evaporated from the surface and craters are starting to appear in the rice, 5 to 8 minutes. Remove from the heat. Spread half the chickpea curry evenly in the prepared baking dish. Spread the rice mixture on top of the curry. Spoon the remaining chickpea mixture over the rice. Scatter the reserved raisins and cashews over the top. Cover with foil. Bake until the rice is tender, 45 to 55 minutes. Remove the bay leaves, cardamom pods and cinnamon sticks before serving.